At Khorus, software is a big part of what we do. But no app can instantly transform your business on its own. Organizational change is notoriously hard, and that’s why we not only offer extensive hands-on services and support to our customers—we also team up with top-notch partners like GO. ensuring the strategy gets implemented. As GO’s team of on-demand growth operators conducts this 6-step process, Khorus becomes a critical tool for capturing the plan, gathering insight, and driving consistent execution. 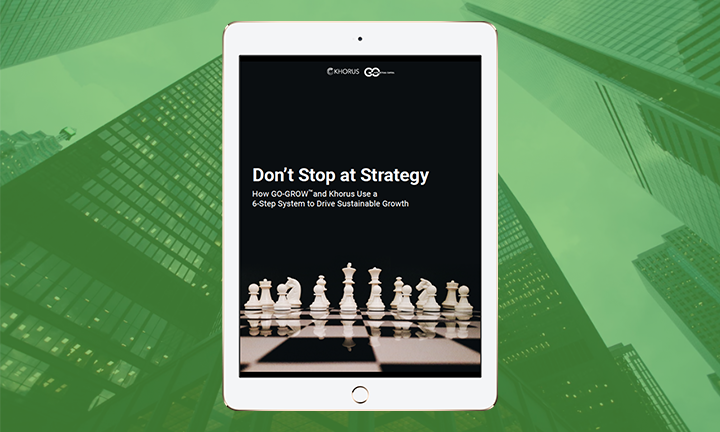 Download Don’t Stop at Strategy now to see how it all comes together in a plan for sustainable growth and value.